I told you we shouldn’t have had those Swiss organise the Trooping of the Colour. Is that a marble on the tank or it earth very far away ? That’s one hell of a hood ornament. If it’s Laumer and there is a tank on the cover then you know it’s a BOLO book. Unlike this version, which definitely doesn’t have a tank. Or a hood ornament. The last time we saw this book, it had something that might possibly have been a demon, but neither a giant robot, a human brain, nor a war. Be off with you, blurb! Despite what the blurb claims, I see nothing particularly human or cerebral about that whatever-it-is inside the skull. For cause of death, I’m thinking . . . brain parasites? Alien brain parasites? Lampreys and grapes in a human skull fired from a tank. Heston Blumenthal’s still going strong, I see. The best way to prepare space lampreys—a lá skull pot! Just heat those babies up over a thermonuclear tank warhead, and serve with a garnish of demon. The sideways-firing tank was withdrawn after strategists realised the possibility of “going the other way”. It is still, however, used in the Alien universe. It’s rare to see the artist’s signature so brazenly placed near the CENTER of the painting. 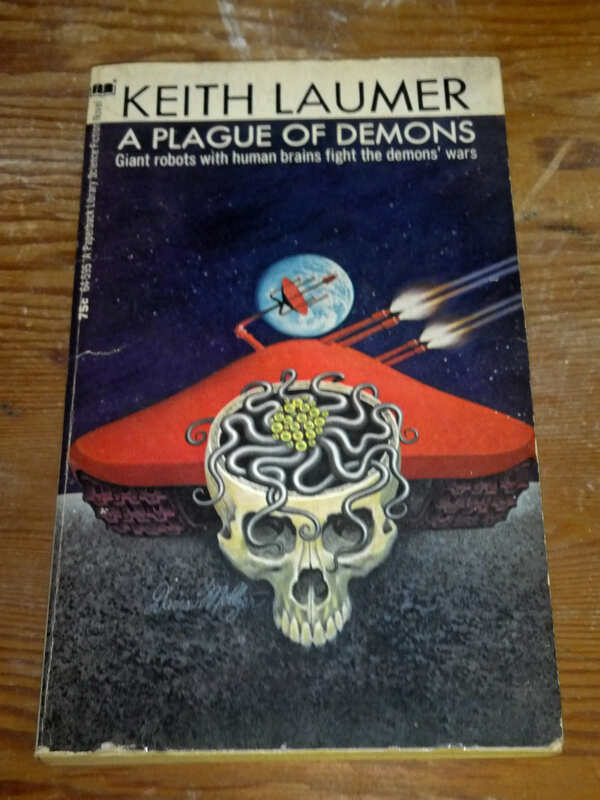 There is yet another way this blurb fails…”Giant robots with human brains fight the demons’ war” makes it seem like the robots are fighting on the demons’ behalf, doing their dirty work for them, though I assume the author means they’re fighting each other. If they really are on the same side, who is the enemy? It must be the tentacle thing in the skull! ….And would you consider a robot with a brain a cyborg instead? Food for thought. According to the Goodreads description, the aliens are harvesting human brains so assuming the aliens are the demons of the title, humans areindeed fighting wars for the demons. Either that or the aliens are just after a tasty snack. Still a rubbish blurb, though. Must be Hungarian. There’s eels coming out of it. A rare glimpse into Donald Trump’s mind.